"Why do we insist that Shah Rukh reinvent himself but we reward Salman for playing the same role again and again? Aamir Khan isn’t part of this conversation because he’s never had a persona. He is the shape-shifter who becomes whatever the role needs him to be. Shah Rukh.. more and Salman have both successfully nurtured images for more than two decades. But while Salman’s superman still has an overwhelmingly strong connect with audiences, Shah Rukh’s romantic hero seems frayed with time and overuse." The Superstar Conundrum - Why Has Salman Khan's Myth Endured Longer Than Shah Rukh's? Here is a really cute kids-filled still of Salman Khan from sets of his upcoming movie Tubelight. 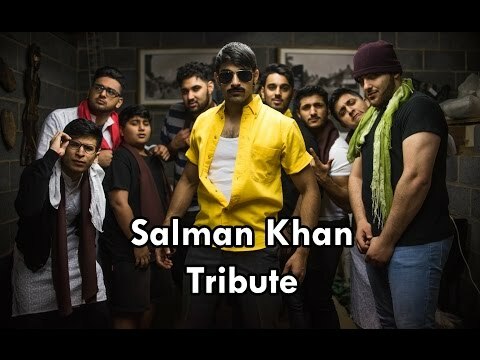 A very enthusiastic and well-made tribute video to Salman Khan by Ahmed Sher Zaman, by recreating Salman's famous song videos. One of the best episodes of Koffee With Karan, where we get the funniest stories from Khan brothers, Salman, Arbaz & Sohail. Salman, Bros On Koffee Couch It's the 100th episode of Koffee With Karan and who better than Salman Khan to celebrate it with. Salman and his brothers, Arbaaz and Sohai..